(CNN) -- The news this week that Portuguese coach Manuel Jose had resigned from his post with Cairo-based Al Ahly marked the end of era, not just for Egyptian football, but for club competition in Africa too. 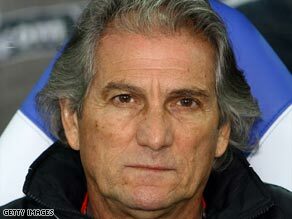 Manuel Jose departs Al Ahly having taken the club to four league titles and four African Champions League wins. For though the news did not create the ripples of interest around the globe that a managerial move in the English Premier League may, the end of a seven-year tenure over two stints in charge, represents the felling of one of the game's regional giants. Taking up the reins of one of Africa's best supported and most demanding of clubs in 2001, Jose ushered in an unprecedented era of success that included the capture of 18 pieces of silverware, nearly double that of Alex Ferguson over the same period. A haul of four league titles, four African Champions League wins, four African Super Cups, four Egyptian Super Cups, two Egyptian Cups and a third-place finish at the 2006 FIFA World Club Cup was a fantastic return by anyone's standards. But it was the performance of the Jose-inspired Al Ahly side in continental competition that built a legacy which will remain for years to come. In this arena Al Ahly rose to match and better the record set by their fierce city rivals to claim bragging rights as the best on the continent. For decades it was Zamalek that held the upper hand, with a record five African Champions League crowns to their name but under the leadership of Jose the status quo was broken and the balance of power swung back across the banks of the Nile to the Gezira headquarters of Al Ahly. Driven on by the talent of such stars as Mohamed Aboutraika, Mohamed Barakat, Wael Gomaa, Ahmed Hassan and Flavio the club known as the "National" became a dominant force. Four Champions League trophies were picked up in seven years, setting a new mark for a coach and helping to take Al Ahly's overall total to a new record of six, a year after the club celebrated its centenary. To maintain such success was always going to be a tall order, and the 63-year-old resigned after Al Ahly were dumped out of this season's version of the Champions League by the unfancied Nigerian side Kano Pillars. A new challenge now beckons for the man who has previously coached Benfica and Boavista among others, as the one to lead the Angola national side. An important role for the team that will play hosts to the 2010 Africa Cup of Nations, but who is to say Jose will not be able to continue his success?